I picked up this bottle of bourbon while it was significantly discounted at my local ABC store. I was out of bourbon, which is a horrible tragedy that must always be addressed. It was only $11 for 750 ml, which means it’s much cheaper than the Woodford Reserve and Bulleit bourbons that I prefer. But I was convinced to try it because I saw that little 7-years-of-age indicator, which I assumed meant it might have some character, and thus, might be a pretty good deal. I was wrong. Its coloring is burnt orange with a deeper red simmering inside the glass. It smells highly alcoholic—it is 101 proof, folks—but beneath that lurks some lovely peach and caramel undertones. You may not get past the alcohol in the nose, though, and you definitely won’t in the glass, or at least you won’t if your bourbon tastes are like mine. I can really tell the difference in quality compared to the higher grade bourbons. It’s rough on my palate, and I have to force it down. I taste a thin bourbon flavor in between the burning sensations with none of those flavors in the nose that seemed so promising. 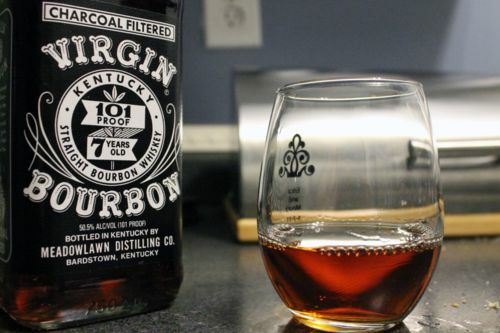 Virgin Bourbon, there’s nothing pure about you for me. I will consider the confidence in Virgin as a mixer! I’m more of a sipper for bourbon, unless it’s a drink like a Manhattan, but the taste of the bourbon’s important in those older cocktails, too, so I don’t think Virgin would be ideal for me. But I’m sure I’ve got some other readers who’d love a cheaper alternative for soda mixing, though! Glad you enjoyed it, Waydo! Where can i buy 7 year old 101 proof virgin bourbon in new york city? I love it. Im into the high proof bourbons, usually going for rare breed or similar bottles. Evan has always been a friend to me and his older cousin is now no different. I have had plenty of good whiskey, pappy, stagg, all the wellers. While those are amazing I think that for its price I will happily buy this bottle and keep some around.